Dominic DeNucci trained Shane Douglas and Mick Foley, among others. March 16, 1981 – MSG Network: Dominic DeNucci defeated Larry Sharpe. April 6, 1981 – MSG Network: Killer Khan defeated Dominic DeNucci. May 4, 1981 – MSG Network: Dominic DeNucci defeated Baron Mikel Scicluna. July 20, 1981 – MSG Network: Sgt. Slaughter defeated Dominic DeNucci. August 24, 1981 – MSG Network: Dominic DeNucci defeated Frank Savage. September 29, 1981 – MSG Network: Killer Khan defeated Dominic DeNucci. October 19, 1981 – MSG Network: Dominic DeNucci & SD Jones defeated Johnny Rodz & Jose Estrada. 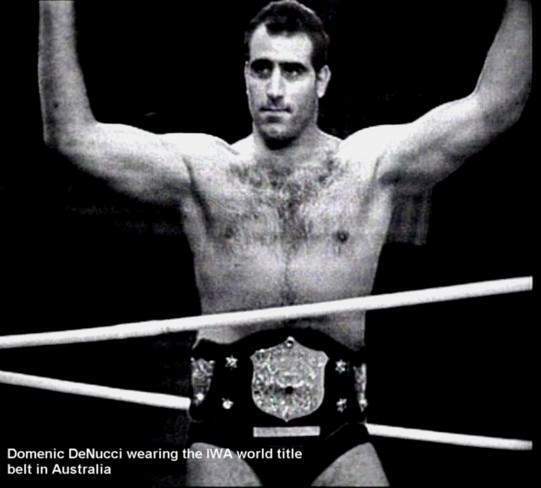 September 6, 1985 – ICW: Dominic DeNucci defeated Mad Russian I.
September 7, 1985 – ICW: Dominic DeNucci defeated Ray Apollo. September 25, 1985 – MACW: The Long Riders (Bill Irwin & Scott Irwin) defeated Dominic DeNucci & Jerry Oski. September 26, 1985 – MACW: Dominic DeNucci defeated Joe Rodriguez. December 26, 1985 – International Wrestling/WWF: Kevin Kelly defeated Dominic DeNucci. June 7, 1996 – WCW House Show: Dominic DeNucci & Tony Parisi defeated Bruiser Bedlam & Cowboy Johnson. July 30, 1999 – Curtis Comes Home: Dominic DeNucci defeated Lord Zoltan. May 7, 2005 – Mark Curtis Memorial: Mick Foley and Shane Douglas w/ Dominic DeNucci beat Al Snow and D-Lo Brown w/ Les Thatcher. August 27, 2005 – WrestleReunion: Ivan Koloff defeated Domenic DeNucci in a Russian Chain match. December 3, 2005 – IWC: Dominic DeNucci defeated Kingdom James. May 12, 2006 – FNW: Dominic DeNucci defeated Lord Zoltan. March 24, 2007 – International Wrestling Cartel: The Legend Bruno Sammartino was given the key to the city of Franklin. ~~~Dominic Denucci w/ Bruno Sammartino defeated Larry Zbyszko w/ Lord Zoltan (Zoltan inadvertently hit Larry Zbyszko). May 3, 2009 – Deaf Wrestlefest: Dominic DeNucci, Dr. Cody Michaels & Shane Douglas defeated Frank Stalletto, JJ Dillon & Lou Marconi. May 29, 2009 – FNW: Dominic DeNucci defeated Samuel Elias by count-out. April 14, 2012 – PWS: Dominic DeNucci & Shane Douglas defeated Lord Zoltan & Shawn Blanchard.